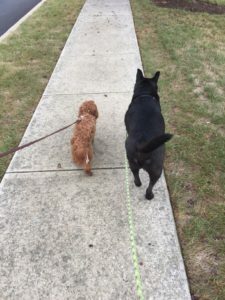 In honor of National Walk Your Dog Week, here are 8 tips to make your walk with your dog more enjoyable for you, your dog, and your community too! Poop bags. Carry them, use them, dispose of them properly. Let your dog sniff! Yes, the point of a walk is exercise – physical and mental exercise is best! Sniffing works your dog’s mind, so when you dog is walking nicely at your side for a few minutes give him a sniff break to sniff something exciting like fire hydrant or street sign post. Sniffing is a great reward for polite walking! If your dog likes other dogs, walk with other dogs. A lot of dogs love to walk as part of a group. They can sniff and explore together, learn to walk nicely together, and hang out with doggie friends – and you get time with friends too – win-win for everyone! If you take a long walk with your dog, bring water. Dogs don’t regulate their body temperature well, so having water to offer is a great way to help your dog cool down on warm Fall days. Take your dog somewhere new for a walk. Chester County has lots of wonderful dog friendly parks, trails, and perseveres. Giving your dog a chance to explore a new trail or park will the walk exciting and fun for both of you. Make a resolution to walk your dog everyday! Walking is great exercise for dogs and people – it can help reduce stress, increase health, and be mood enhancing — for you and your dog! Pepper’s Paws, LLC provides in home dog training in Chester County, PA. We also teach Puppy Basics to Advanced Adult Dog Manners and dog sports classes at Dogtopia of Chester Springs.